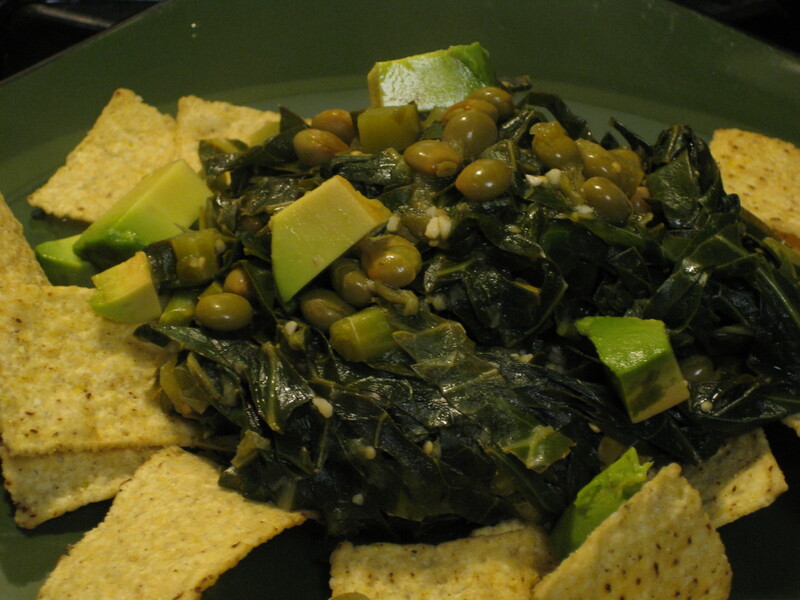 In the South, we eat Collard Greens on January 1st to bring us wealth in the new year. I would prefer tacos. So I made collard greens into tacos. You can put it atop nacho chips, in taco shells, over Spanish rice, as pepper stuffing, rolled into a burrito or enchilada, and so much more. I make green chile and tomatillo salsa with peppers from my garden. You can buy a prepared salsa verde or make a quick one by combining 1 cup each chopped green chiles, white onions, and tomatillos with 3 TB white vinegar, juice of 1 lime, and salt and pepper to taste. After collards are well washed, roll and chiffonade cut them so they are as thin as possible. Cut to the bottom of the leaf. The stalks are not used in this dish. Save them for a veggie pie or crudite. I give my collard stems to the dogs. Place greens in a large skillet or wok with vinegar and citrus juice. Heat pan on medium. Put lid over the greens to help them wilt. They will cook down considerably. Add salsa and seasonings. Stir fry to coat greens. Add pigeon peas and turn heat to low. Cover and let heat through 5 minutes. Salt and pepper to taste. I like this served with avocado cubes and Jalepeno Tabasco sauce. This is a great way to savor every last piece of that expensive gluten-free bread. If you eat gluten, this recipe accommodates regular bread cubes interchangeably. 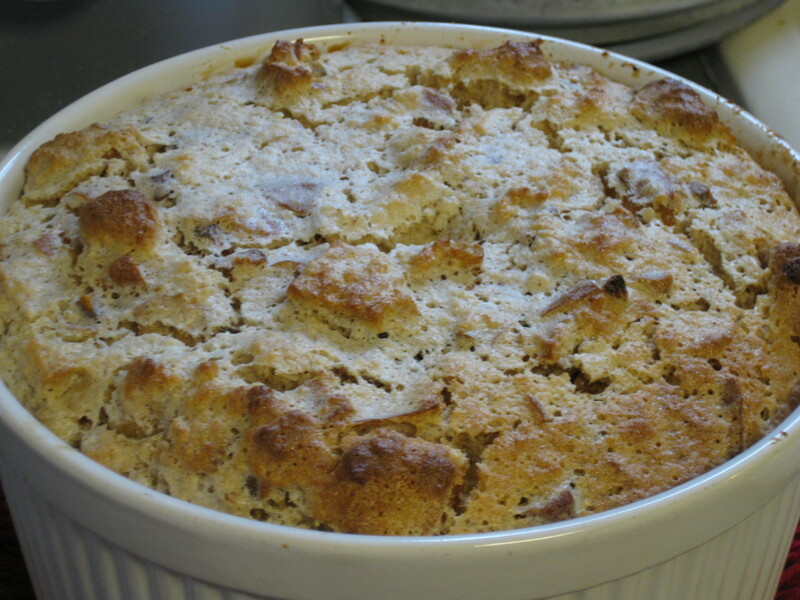 Dried fruit is a great addition to bread pudding. The chewy texture of the apricots compliments the soft pudding very well. A budget friendly tip on breads: save you scrap heels and stale bread pieces in a gallon size freezer bag. These pieces can be used for on-the-spot crumbs, crouton cubes, or puddings like this! Mix milk, egg yolks, 1/2 the sugar, nutmeg, and apricots in a large bowl until sugar dissolves. Add bread cubes and stir to coat evenly. Gluten-free bread will absorb the “custard” very quickly. Whip egg whites and remaining sugar until stiff peaks form. Fold meringue into soaked bread cubes. Transfer mixture into a buttered souffle dish. Bake in a water bath at 350 degrees F for 45 minutes. I made a gluten exception for this. See why? Wait 10 minutes for the mixture to become foamy. Now mix in about 3.5-4 c unbleached flour, one cup at a time. Once the mixture becomes stiff, start kneading with floured hands. Knead for about 7 mins, turning the dough over often. Add a little vegetable oil to the outside of the kneaded dough ball and put it in a bowl. Allow to rise in a slightly warmed oven (turn the oven on for a few min, then off before you put the dough in) for about one hour, or until the dough doubles in size. Cut the dough into thirds and roll out (using flour) into long coils. 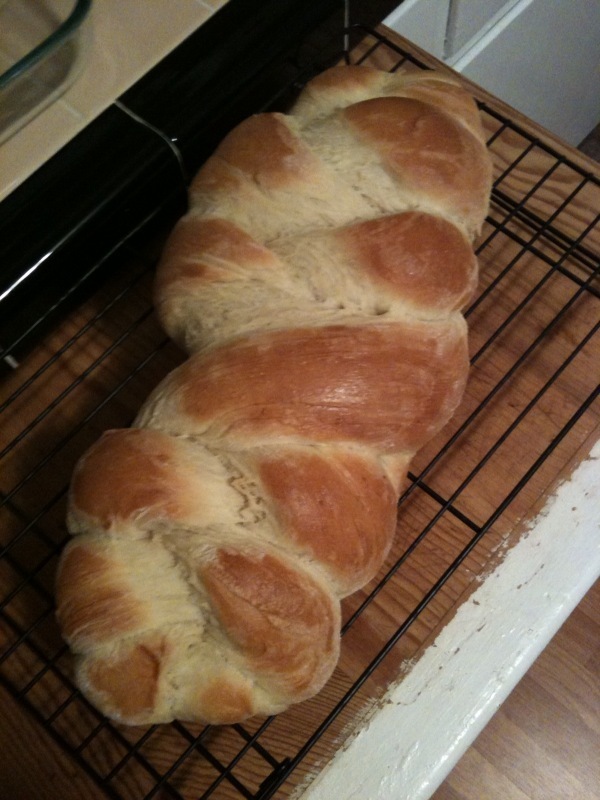 Braid it, starting in the middle of the loaf and working out to either end. Place onto a greased glass baking pan. Allow to rise for 15-30 additional minutes at room temperature (the dough should double in size again). Glaze with one egg yolk mixed with 1 tsp water. Bake for 30-45 mins at 375. Everyone likes layer dip. It’s easy to make for any party. It’s great to make the day before and let rest in the fridge over night for more intense flavor. We started eating it and forgot to photograph it... again! Layer 1: Place pintos and taco seasoning in your food processor. Blend to creamy. If the mixture seems a little dry, add a little lime juice to thin it out. Layer 2: Spread chopped green chilies over beans. Layer 3: Arrange avocado slices over chilies. Sprinkle with salt and lime juice. Layer 4: Add black olives over avocado. Serve with chips, crackers, veggies, or anything that will scoop this out. Like a spoon! You can use store bought taco seasoning, but it may contain gluten, fillers, chemicals, or non-food ingredients. Weird! Shake together in a jar and store in a cool, dry, and dark place. Seasonings keep for 4 months. This is a quick budget meal that tastes so good everyone will think you spent the whole day in the kitchen. By using a mixture of butter and olive oil, the cakes crisp up very nicely and have a wonderful salty flavor from the butter. Work all ingredients together well. Let mixture rest for a few minutes so bread crumbs absorb moisture from eggs. This is especially important when using gluten-free bread crumbs which are sometimes drier than wheat-based bread crumbs. Add both evoo and butter to a saute pan or iron skillet. Heat on medium high. 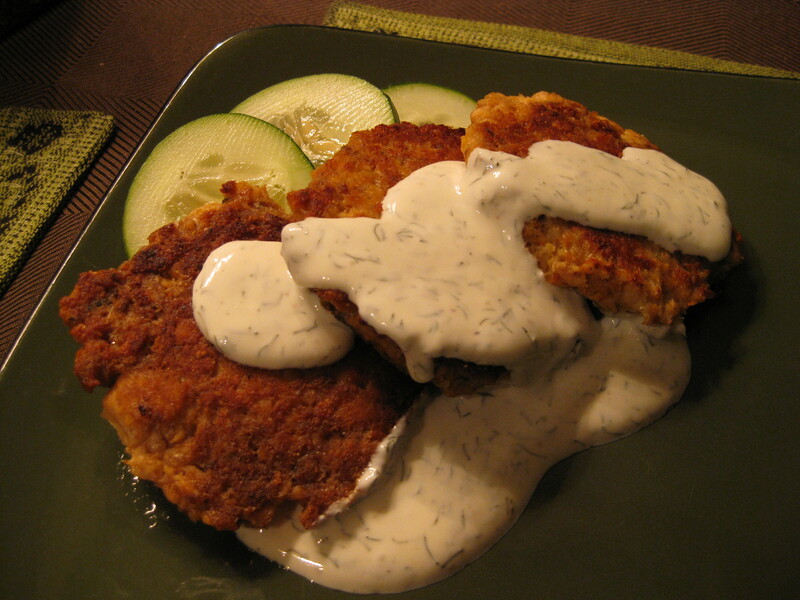 Patty out the salmon cake mixture and fry 4 minutes on each side. These cakes are delicate. They only need to be turned once. Don’t push them around in the pan. This sauce can be made in advance. It keeps in the fridge for about 1 week. Oh deliciousness! 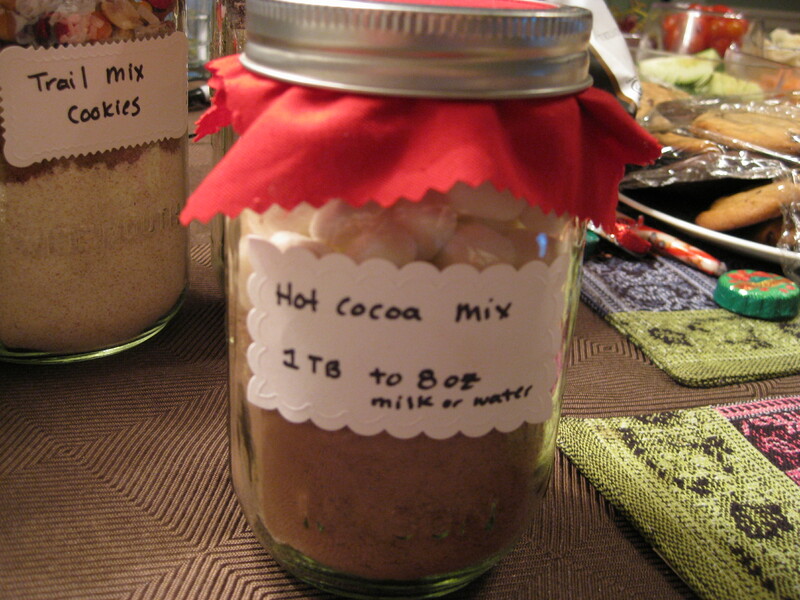 Here’s what my family got in their stockings… Cocoa mix! This is a great hostess gift for winter parties. Place everything in a large bowl, except the marshmallows. Mix thoroughly, breaking up lumps, until powders are as uniform as possible. Funnel mix into pint sized mason jars to 2/3rds full. Top with marshmallows. Cover jars with lids, fabric, and screw top. Attach labels with instructions to mix 1 tsp with 8 oz milk or water. This is a great addition to any party spread. Everyone loves bacon. Remember to let the meat rest before slicing to keep it juicy. Start with your family’s favorite cut of steak of about 2-3lbs. A large London Broil or a pair of flank steaks or flat iron steaks will work beautifully. Butterfly the steak with a sharp knife. Filling: Lay strips of bacon, about 1/2 lb of applewood smoked is fabulous, across the opened steak. Sprinkle crumbled Bleu Cheese over bacon, about 4 oz. 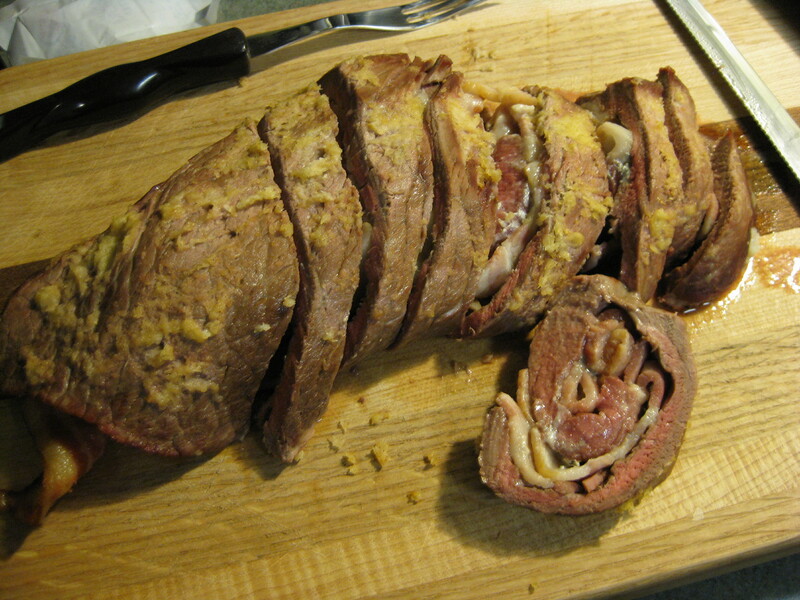 Roll steak into log, being careful to keep stuffing in. Top with horseradish butter: 1 TB fresh grated horseradish plus 2 TB soft butter, whipped with 1 tsp salt. Spread the mixture over top of rolled steak. Place on broiler pan. Bake in 300 degree F oven for 30 min for medium, 40 minutes for medium well. Allow meat to rest 10 minutes before slicing. MAKE AHEAD TIP: The steak can be stuffed ahead of time and frozen for up to 1 week. Wrap in plastic film tightly before freezing. Thaw in the fridge then bake before serving. This will kick up your veggie or relish tray in a big way. 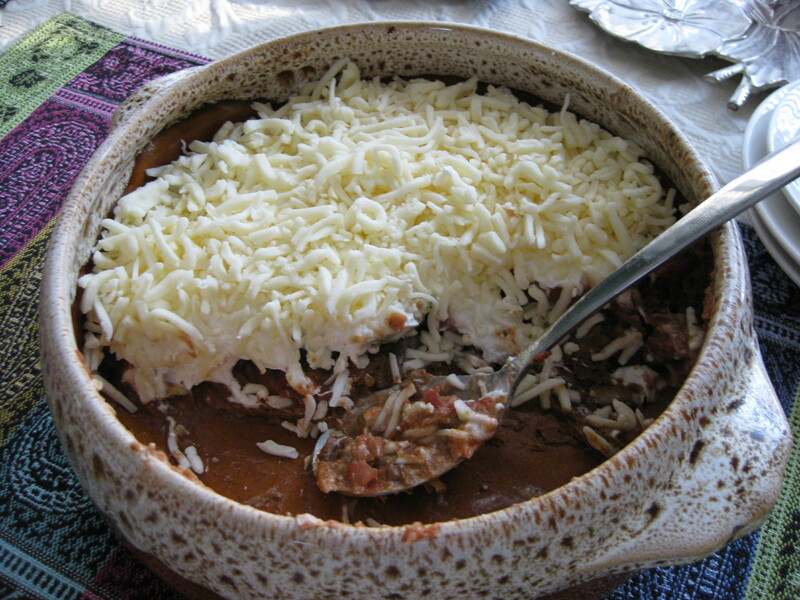 Hot dips are perfect for winter entertaining and the sharp cheese flavors in this one pair nicely with winter wines. Caramelize onions in butter over medium heat. When onions are GBD (golden brown delicious), stir in broth 2 TB at a time. Deglaze the pan and allow the broth to reduce. Allow to reduce by half. Stir in cheeses and reduce heat to low. Stir well to incorporate. 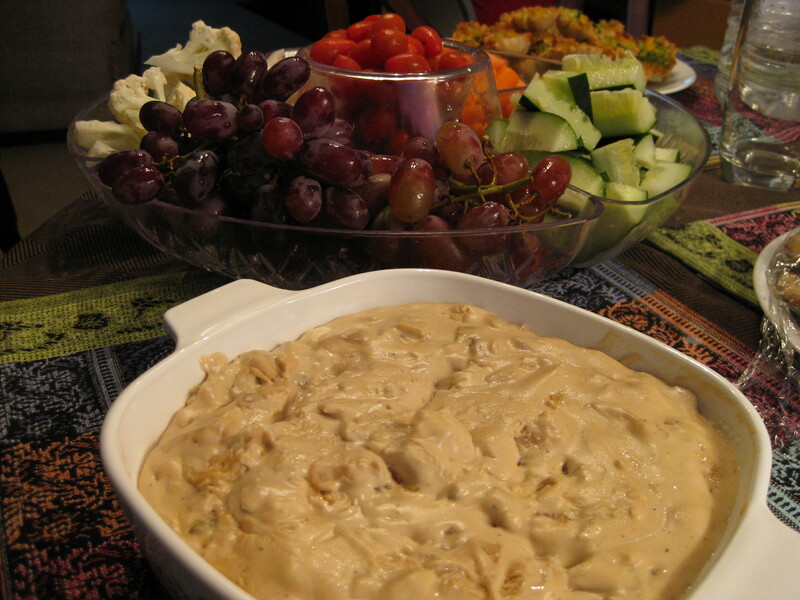 Dip can be served immediately or covered and stored in the fridge up to 5 days until your party. To re heat, pop in the oven with the rest of your party spread until bubbly. Also great served in a chaffing dish to maintain temperature. A warmed serving dish will keep dip very soft for about 2 hours. Rolling your own sushi is very easy. We make “mega” rolls with all of our favorite ingredients in a single roll. The secret to sushi that holds together is the rice! Steam it, season it, and COOL it. Get the short grain sushi rice on your next visit to the Asian market. You can use other types of rice, like standard brown rice, but the starch content may make things a little too sticky for a first time roller. If you have a rice cooker, use it. If not, get your pan with the tightest fitting lid. Put your rice and water in it, put the lid on, and set it to low. Some people weigh down the lid with some cans. Once the rice is cooked, season it with 1/2 Cup rice vinegar. Stir and cool completely. Smoked salmon, cream cheese, smelt roe, shredded carrot, avocado, cucumber sticks, pickled Japanese raddish, or other filling that your family likes. Slice vegetables into long thin strips for easiest rolling. Slice cream cheese with a long knife warmed in water for a thin clean cut. Lay out a sheet of nori sea weed. Press rice down on 1/2 the sheet. Pile the filing on top in the center of the rice. Wet the top 1/4 inch of nori with water. Roll the sushi tightly, squeezing the rice and filing snugly together. The sea weed will seal with water. Slice roll with a very sharp knife. Serve immediately or chill up to 1 hour. Do not store rolls in fridge unsliced. The nori may become soggy on the bottom. Serve with wasabi, pickled ginger, and soy sauce. I’m on a mission to keep your family from saying “Turkey again! Ewww!” so you can eat up all your food, waste less, be greener, and impress them with your versatility and kitchen prowess. Cover carcass ¾ of the way with water (about 8 cups). Boil this (right in the roasting pan if you’ve got a nice one) covered until liquid is cloudy and carcass is falling apart, about 1 hour. Remove carcass, bay leaves, and garlic cloves. Separate out 4 cups of soup base for future deliciousness. It freezes well. Little floating bits of meat should stay in the pot. You can also make this in your crock pot. Allow soup based to simmer for about 2 hours. Depending on the thickness you prefer, you may need to add back more of the soup base. Bring to a boil then simmer 20 minutes or until celery is tender. Awesome served with cheddar croutons. Slice left over rolls or bread into ½ inch rounds. Top with shredded cheddar and bake at 375 degrees while the soup is simmering. Croutons are ready when cheese is bubbly, bread is crispy brown.